Estate planning is confusing to most people and most do not have a plan in place. Many people take for granted that their assets will go to the right place after they pass and even certain celebrities have made serious estate planning mistakes, leaving their heirs to deal with the aftermath. Michael Jackson – Superstar Michael Jackson’s death triggered a series of ongoing court battles over his estate. One of Jackson’s biggest estate planning mistakes was creating a trust – and then failing to fund it. Jackson’s estate could be in the courts for many years to come. Philip Seymour Hoffman – His mistake was not updating his will. The will left all his estate to his partner and only mentioned his son; his daughters might not share in the estate. Pablo Picasso – Picasso neglected to execute a will. Heath Ledger – He failed to redo the will he had signed before his daughter was born. That left his entire estate to his parents and his sisters. The list is long, but illustrates how important it is to have a proper estate plan in place and the issues that can be left behind for your loved ones. 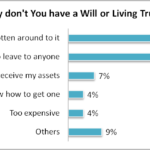 The most common reason why people do not have an estate plan is the belief that they are not wealthy and do not have significant assets. The fact is that everyone should have an estate plan in place to ensure their assets are left according to their wishes. Without an estate plan, state laws will dictate what happens upon your death or incapacitation. So, what are your assets? Anything you own at the time of your death or incapacitation. Financial assets – For example, savings accounts in a bank, retirement accounts, stocks and bonds, life insurance, etc. Money Owed to You – Tax refunds, an inheritance, outstanding loans from your debtors, etc. Real Estate – Your home, office or any other real estate you own, etc. Other Assets – Cars, furniture, jewelry, art, etc. To take the first steps in planning your estate, consult with an experienced estate planning lawyer who can guide you on the best way to protect the assets you have worked so hard for throughout your lifetime. In life, changes are inevitable and it is important to update your estate plan to avoid slip-ups. Reviewing and updating your estate plan when there is an important change in your life such as a birth, death, divorce, or marriage is recommended. Also, changes in your finances, job, residence, and many other factors should also trigger a review of your plan. Finally, a change in your estate planning goals or in the law can also be reasons for a review. Life is uncertain and preparing for the unexpected is always a smart thing to do. If you found yourself with a long-term disability, who would handle your personal and financial affairs? Decisions regarding the management of your finances, raising of your children, or your healthcare are extremely important. Having a health care proxy, power of attorney, living will and/or a trust in place is critical if you’re unable to care for yourself. Most people want to name a family member or trusted friend as their personal representative, executor or trustee, but it’s not always the best idea. In some scenarios, especially if there is potential for disagreement among family members, a more objective third party might make more sense. It may even be best to hire a professional as trustee to help avoid family conflict. There are several questions you will need to ponder in order to make an efficient plan: Do you want your money to go out in a single payment to your children, or perhaps you want it to go out in payments at certain ages/milestones during their lives? What if they are minors? If so, a guardian will need to be appointed.Do you want a minor child or grandchild to receive an inheritance at 18 years of age? Is it wise to turn over a significant inheritance to a child or grandchild at that age? These are questions that are best discussed with an experienced estate planning attorney. Both a will and a trust should always contain a residuary clause in addition to any specific bequests. “Residuary estate” is a term used in probate law to identify the portion of an individual’s estate that remains after all specific gifts and bequests have been made and all claims of the estate are satisfied. Not only does a residuary clause handle property that may have been overlooked or not otherwise disposed of, it can handle bequests that are void due to the death of the beneficiary. Your estate may be subject to state and/or federal income tax. As a result, consulting with a lawyer can help you navigate the best way forward so you are able to protect your estate as much as possible from tax liability. Our expert attorneys will provide an initial free consultation to answer your questions. If you have a living trust, be sure to fund it with your assets by changing record title or beneficiary designations as instructed by your attorney. With a simple will, most of the distribution happens through the probate process. A trust, on the other hand, must be funded while the trust maker is alive. This assures that assets are transferred to the trust and pass as the trust maker intended. An unfunded or partially funded trust does not avoid probate. Proper trust funding involves moving assets that are in your name and re-titling or reassigning them in the name of the trust. Most state recognizes joint ownership with rights of survivorship. What that means is property or accounts titled in this manner will pass directly to the other owner(s) upon the death of one party. Also, if beneficiaries are properly indicated in certain situations, assets should pass directly to the beneficiaries and should not be subject to the probate process. You should also add secondary beneficiary designations in case your primary beneficiary dies either before you or soon after. Examples of assets that may be titled in joint ownership or have beneficiary designations include vehicles, real estate, bank and investment accounts, retirement accounts, annuities and insurance contracts. It is important to let the people named in your estate plan – whether a guardian for your children, a successor trustee, a health care agent, or a beneficiary – know what role you are asking and expecting them to play. To help ensure a smooth transition during a difficult period, it is not a good idea to surprise someone with an unexpected role. Communicating your wishes ensures your desires are understood by your loved ones. Understanding the nuances of estate planning can be overwhelming. The “Do It Yourself” (DIY) attitude in order to avoid hiring an attorney can lead to big mistakes. There are numerous websites that promise an easy and cheap way for you to draft your own estate planning documents. Just because you can do it yourself does not mean that you should. An experienced attorney can prepare a strategy based on your custom needs to help you get the best benefits for your loved ones. They will also advise you on the legal ramifications and tax implications of your plan. There are many options available to you, and your attorney or tax advisor can help you select the ones that are most appropriate for you. It’s never too late to get started and have a proper estate plan in place. For further guidance in creating an estate plan or reviewing an existing plan, call 978.474.8670 or contact us. They made planning and putting together my trust an easy and effortless job. They answered all my questions and helped me to better understand the process. Thank you!